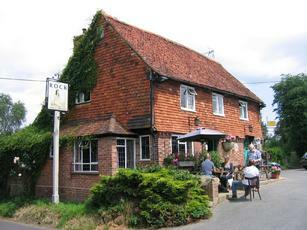 We went here Friday evening 21/06/13 via The Wheatsheaf at Bough Beech which seemed closed. The Rock is a popular pub on a summer evening with groups outside and inside enjoying a good drink.Dogs are welcome.There was a mixture of customers from suit and tie to tradesmen characters.There were a few diners.The bar staff were friendly.There were two pumps of Larkins Ale brewed locally and another guest ale.There is a garden around the back with picnic tables on a grassed area.Two pints of Larkins,pint lime and soda and three packets of crisps came to £10.40.The Larkins was very good.I can understand some of the other comments about this pub.It can be a little off putting to some people making your way through lively groups around the entrance door and through to the bar.The view to the guest ale pump was obscured by a regular at the bar but i'm sure he would have moved aside for me.We would go here again.It is just the same as when i went here 25 years ago.The stone floor and decor makes one welcome if you had been out walking or in work clothes.The toilets were clean and tidy with soap and paper towels.The car park could fill up quickly.Several cars were parked down the lane.I think this is a proper pub for a proper drink and you just have to mix in. Well Scrumpylicious I'm sorry to disappoint but I am not a local at all, I live in Tunbridge Wells... So whether you believe my story or not it is in fact the truth. I'm sorry if you had a bad time there but my experience has been very good, hence my positive review. Just because my time there differed to yours does not make me a liar! A nice, if wholly implausible, story there, KettleChip. It is so obvious that you are one of the many locals currently trying to sell your property. From what I have seen, nothing sells in that area and, judging by the locals that frequent The Rock, I am not at all surprised. A pretty little pub in a fetid backwater. What a shame.